Last month, Jon and I spent a week in Liguria, the coastal region of northwest Italy. 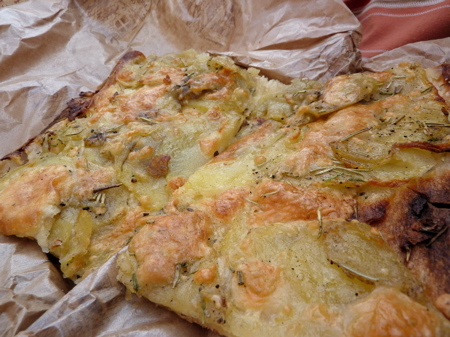 Of course, this being Italy, there were plenty of regional foods to enjoy, the most famous of which is pesto Genovese (aka pesto) and focaccia. Because Jon and I flew in and out of Genoa, we decided to spend a weekend there before moving on to the Italian Riviera, which was meant to be the focus of our trip. What turned out to be pleasant surprise in Genoa were the dozens of beautiful old palazzo lovingly restored and open for tour — the city was a former trade and banking powerhouse — and the food wasn’t half bad, either, though I suspect with a little more research, we would have eaten like kings. Soho Restaurant & Fishworks. Our B&B owner highly recommended it, and the restaurant has a bar/lounge vibe going on, so we probably would have enjoyed the decor more if we’d gone for dinner instead of lunch. In any case, seafood is the restaurant’s focus, which makes sense given its location close to the port. Overall, our food was well prepared. Jon and I especially enjoyed the baby calamari and pesto, as well as the squid ink tagliatelle with prawns. We spent 48 euros on lunch, which seemed a bit pricey for two starters, a shared main and a glass of house white, but the food, while simple, was fresh and tasty. You could do a lot worse. Mua’ Ristorante also had a bar/lounge aesthetic. We found the restaurant through this glowing May 2010 writeup in the New York Times, calling it “one of the city’s finest restaurants.” The restaurant aims to serve regional specialties with a twist, but Jon and I most enjoyed the dishes that skipped the “twist.” A starter portion of mandilli al pesto (wide, flat sheets of egg pasta) for 9 euros was a highlight. Dinner for two totaled 59 euros with a single glass of wine, and other than recommending that you order the more traditional dishes on the menu, my only complaint was the too-cool-for-school servers who seated us in the back near the loos. I hate when that happens. 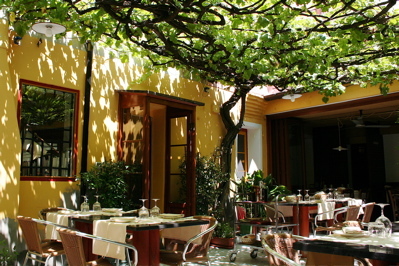 Trattoria da Maria is located very close to Mua’ Ristorante, but is the opposite in style and price. It’s homey and was described by The Minimalist (Mark Bittman) in this July 2006 New York Times article as “one of my favorite restaurants in the world. I must, however, issue a caution: this is really a workingman’s lunch place, a dive, a cheap eats joint.” When Jon and I showed up for lunch, we were immediately reminded of another Mark Bittman recommendation, Chez Palmyre, in Nice, but this one compared less favorably. Yes, the lunch was cheap (8 euros prix fixe for a starter and main), but our food wasn’t especially tasty. 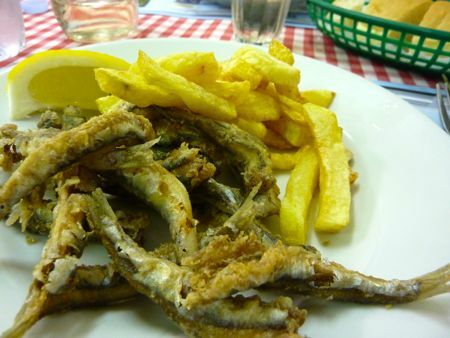 I was most looking forward to the fried anchovies, but they were served lukewarm. Who wants lukewarm fried food, at any price? Da Gaia Ristorante was the worst of the restaurants we tried in Genoa. It came highly recommended by our B&B owner, but it was old-school in a bad way. Pricey menu and dingy decor, with food that was weighed down by thick sauces. 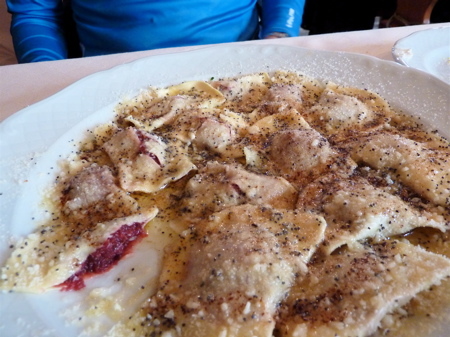 We thought a place like this would make a strong showing with regional specialties like pansotti, a ravioli filled with a variety of greens, marjoram and ricotta cheese, and tossed with a walnut pesto. But we found it tough going to finish our two starters and two mains. Maybe Da Gaia shines when it’s cold outside. Of the palaces we visited, I most enjoyed the Palazzo Spinola, which now houses artwork and decorative knicknacks on the top floor (thus making it the “national gallery”), but I think the real draw were the rooms of the mansion itself. 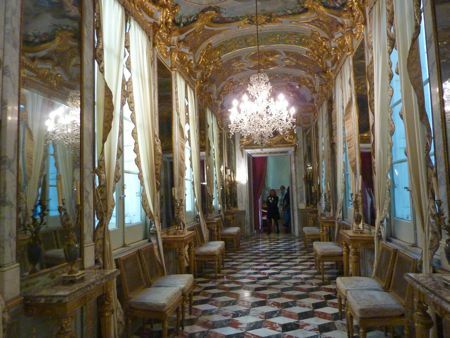 Touring the rooms is like being on an episode of MTV Cribs, 16th-century-Grimaldi style. 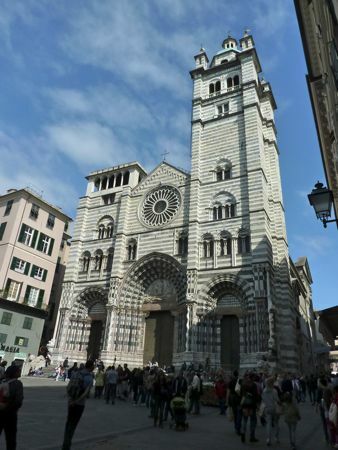 Jon and I also spent many a sunny hour sitting on the steps of San Lorenzo Cathedral, the city’s main cathedral, eating gelato or snacking on focaccia. 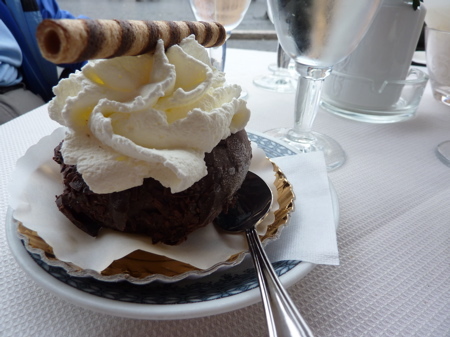 There are a couple of places near the cathedral selling both, and though we never settled on a favorite focacceria, we did think that for gelato, the nearby outpost of Grom Gelato was hands down the best option. Having sampled their wares five times in 36 hours, I consider myself an authority on Grom’s flavors. It turns out they’re all delicious. We stayed at B&B Quartopiano, wonderfully located in Genoa’s atmospheric old town next to the Palazzo Spinola. 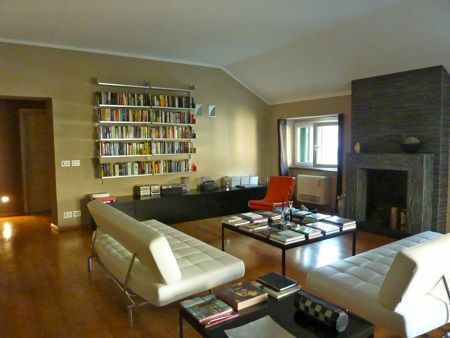 The living room/common area is stylish and comfortable, and our room was also clean and sleek. However, for 150 euros a night for a small “comfort” (cheapest) room, I was expecting a much better breakfast (comprised of defrosted and toasted pastries, along with large but oddly-flavorless cappuccinos), and more importantly, a lift. It’s not just that the B&B, true to its name, is on the fourth floor of an old palazzo. It’s that each floor has incredibly high ceilings, so you end up climbing seven solid flights of stairs, which can be exhausting (with or without luggage), even when you’re not 33 weeks preggars. Genoa Aquarium. Unless you have kids, avoid the much-hyped Genoa Aquarium. Like many port towns hoping to rejuvenate piers and wharfs that have fallen into disuse and disrepair, Genoa has splashed out and heavily marketed a newish Aquarium. Jon and I had run out of things to do on a quiet Sunday, so we decided to check it out. It’s dark, crowded, loud and expensive (18 euros per person). But if you have to go, buy your tickets from a tourist information office. 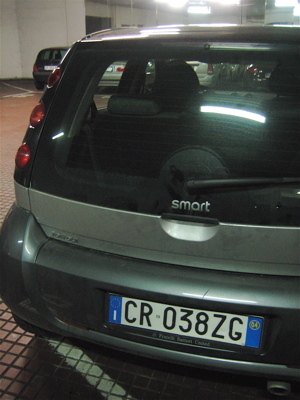 There’s a particularly helpful one located on the Piazza de Ferrari. This way you can skip one of the queues (to buy the tickets) and go straight to the queue to get into the aquarium. Tickets are timed entry, and we found going late in the afternoon minimized the time spent queuing. Overall, Genoa turned out to be more than just an airport in and out of Liguria. The cheerleader materials at the Genoa Tourist Information office described the city as like Barcelona before BCN hit the tourist big time. While I wouldn’t make Genoa a destination on its own, if you’re headed to the Italian Riveria (Portofino, Santa Margherita, the Cinque Terre), it’s worth spending some time in the city. B&B Quartopiano, Piazza di Pellicceria, 2, Genoa; +39 348 7426779 (cheapest rooms start at 150 euros/night in May). Closest metro: San Giorgio. 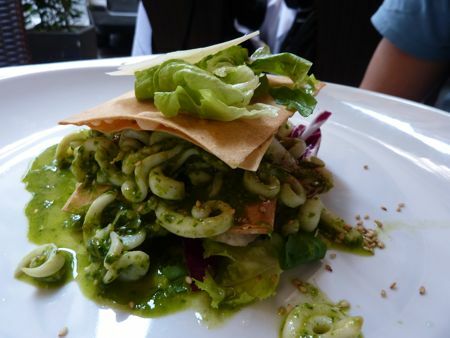 Da Gaia Ristorante, Vico dell’Argento, 16124 Genoa; +39 010 2461629; closest metro: Darsena. Open Monday-Saturday, 9 am to 6 pm. 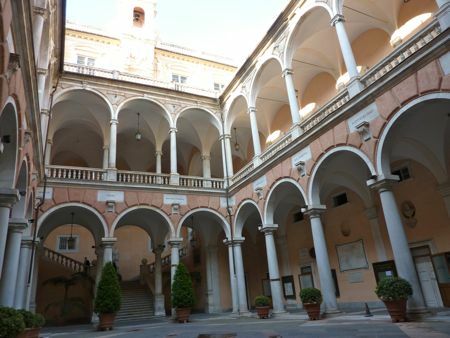 Galleria Nazionale di Palazzo Spinola, Piazza di Pellicceria, 1, 16123, Genoa; +39 010 247 7061; 4 euros a person admission with no English brochure or map available. Open Mon-Sat 8:30am-7:30pm; Sun 1pm-8pm. Dal Paino. Located just around the corner from the much-hyped Da Baffetto pizzeria, Dal Paino was a tip from my friend, Emilia, who loves Italy as much as I love France (which is a lot). A little googling revealed that Dal Paino’s owners are related to Da Baffetto’s owners, and when you turn up at Dal Paino, the sign outside even says “recommended by Da Baffetto.” We ate here twice – once because of Emilia’s tip, and again because we tried to eat at Da Baffetto but were scared off by the mile-long queue. The pizzas at Dal Paino are thin crust with a nice char from the wood-fired oven, and the pastas are similarly simple and beautifully-prepared. 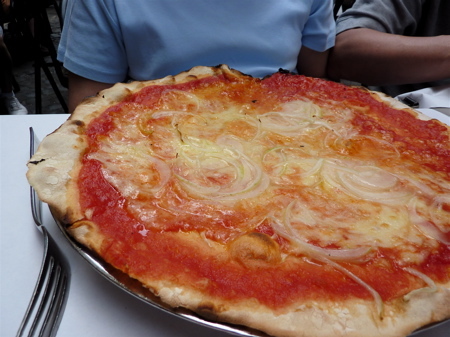 The rigatoni carbonara and the onion (cipolla) pizza were two of my favorite dishes on the menu. And don’t even think about skipping Dal Paino’s suppli and superlative fiori di zucca fritti, which perfectly balanced anchovy saltiness, creamy ricotta, and vegetal sweetness. A filling meal here with shared starters, generous-portioned mains and modest drinks cost about 15 euros a person. Forno Campo de’ Fiori. 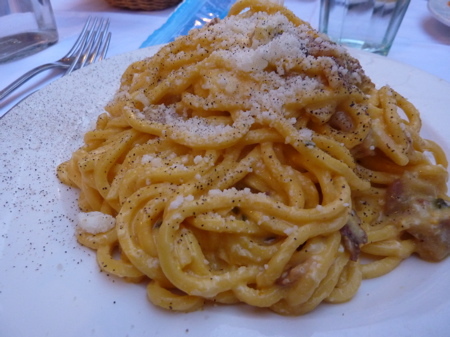 This place is in every guidebook and highly recommended by Tamarind & Thyme in her November 2009 Rome posts. All I can say is: it deserves its fame. Step up to the pizza counter and order slices of whatever’s coming out of the oven. It’s all good. Trust me – I tried it all. 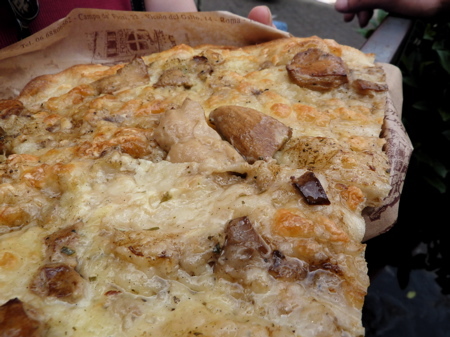 The porcini mushroom pizza and the rosemary-scented potato pizza are my favorites, though the garlicky-sweet melanzane (aubergine) is no slacker, either. We ate well here for about 5 euros a person for a ton of pizza. The Forno is split into two buildings, and the sandwiches and cookies sold across the alley from the pizza part are worth a try too, especially the almond-scented pignoli cookies. The hours seemed a bit haphazard here, but luckily we regularly passed through Campo de’ Fiori and caught the place while it was open. La Montecarlo. Again, recommended by Tamarind & Thyme. And again, a pizzeria not far from Da Baffeto. (I’ve started thinking of Da Baffetto, Dal Paino and La Montecarlo as “the Pizza Triangle”). La Montecarlo was a perfect lunch spot with tables spilling out into a shady stone alleyway just off the Corso Vittorio Emanuele II. 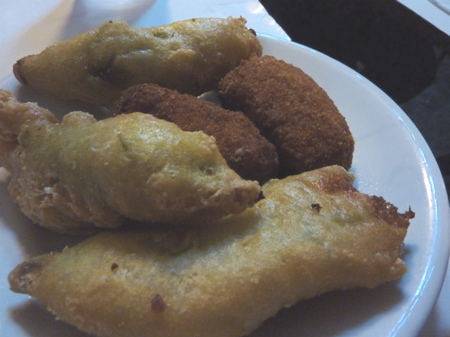 The fried appetizers (suppli, fiori di zucca) were alright, but not half as good as the ones at Dal Paino. What was very good, though, were the thin-crust pizzas. The crust at La Montecarlo was slightly more brittle and crispy than at Dal Paino, which my father loved, though I preferred Dal Paino’s slightly-chewier dough. Extra points to La Montecarlo for the old italian ladies who sat at the table next to ours and ate us under the table by ordering huge pasta courses and individual pizzas. Lunch with a few shared fried goodies, a pizza each and sodas totaled 14 euros each. Antico Forno La Stelletta. Two strengths: (a) its location in the heart of centro storico about a block away from San Luigi dei Francesi church (Caravaggio lovers, alert!) as well as from the apartment we rented in Rome, and (b) its open-7-days-a-week schedule. Additional strengths: its focaccia-based pizzas – chewy, olivey bread topped with, say, an bright-sweet tomato sauce or a garlicky-cheesy broccoli. Less endearing were its somewhat-dry cornetti and pastries. 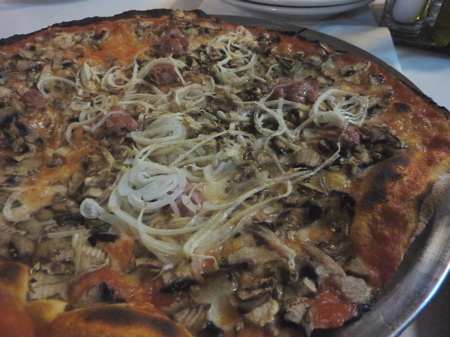 Pizzeria Leonina. I got this tip from Krista’s blog, and you know, the pizza wasn’t awful, but it just really paled in comparison with the other places listed above (especially Forno Campo de’ Fiori). 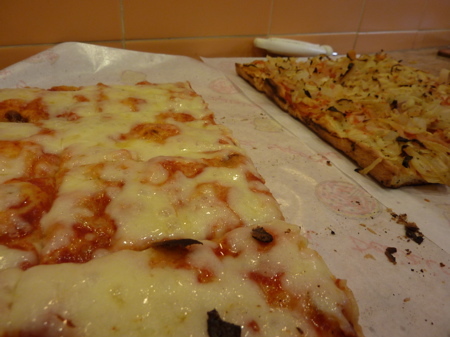 The place serves pizza al taglio, which means you buy the pizza by the rectangular slice. It’s the Roman way. The cheese just seemed extra cheap and greasy here, and the pizza crust lacked the character and flavor that we had at other places. On the (significant) plus side, Pizzeria Leonina sits really close to the Colosseum and Forum, and after walking by several blocks of tourist-trap-looking spots in that area, I can see why Pizzeria Lenonina is such a winner by comparison. The pizza is indeed cheap, with most varieties sold for 12-13 euros per kilo and one kilo being more than enough to feed three hungry people. (100 grams is an etto, by the way). 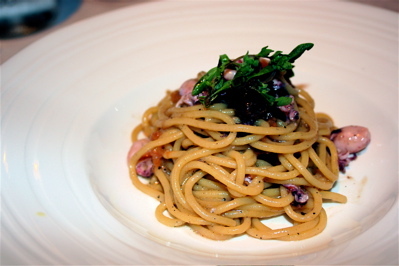 Ristorante Maccheroni. I had a great time here when I last visited Rome in August 2006. And it’s around the corner from the apartment in Rome we rented this time. So one night, I dragged everyone here for a bit of nostalgia. 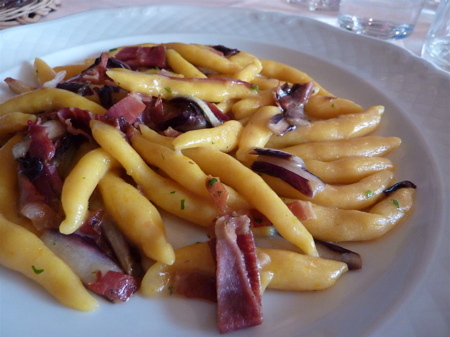 The service was lovely and we enjoyed our table outdoors in the Piazza delle Coppelle, but the pastas we ordered lacked oomph (and seasoning, now that I think about it). My spaghetti carbonara was a particularly big disappointment. Lots of egg yolk, but where was the meaty saltiness of guanciale? Even after dousing it with salt, it remained a watery, yolky mess. In any event, Piazza delle Coppelle is a lovely little square for you 30-something yuppies (not me, of course), so perhaps drop by for aperitifs and move on when it’s dinnertime. 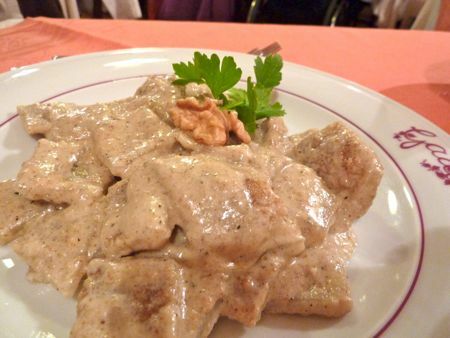 15 euros a person for shared starters and individual pastas. Just a few final notes on picture-perfect Cortina in case you’re thinking of planning a trip there (you should). 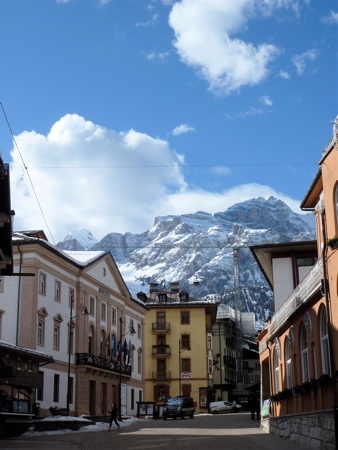 We stayed at the Hotel Corona, which is a 10-minute walk from the pedestrianized center of Cortina. Our group booked the hotel through a travel agent, who definitely exaggerated its virtues. Jon and I paid £200 a night for half-board, meaning breakfast and dinner were included. On the plus side, there’s a ski bus stop right in front of the hotel, and the owner/manager is super helpful and speaks perfect English, as did a waitress in the hotel restaurant who we came to enjoy speaking with. On the down side, the rooms were pretty spare (we were put in an Annex to the hotel) and we didn’t value having a hotel-provided dinner, though out of laziness and a sense that it would be a waste of money otherwise, we ate in the hotel most nights. The meals provided weren’t bad, but they weren’t memorable, either. If I were choosing a hotel based solely on location (and knowing nothing else about these hotels), I thought the Hotel Cortina and the Hotel de la Poste were ideally situated, smack in the middle of Cortina’s pedestrianized Corso Italia. Jon and I are unambitious skiers, so we prioritized finding (1) long, scenic, easy trails (of which there are plenty in Cortina) and (2) delicious lunches (of which there are plenty in Cortina). The views in all directions were gorgeous; the snow was powdery; and the sun shone bright on most days of our trip. We lucked out tremendously. And the private instructor who helped refresh our skills encouraged us to ski the easy slopes around the Olimpia lift (just west of the main Socrepes lift), and he was, of course, dead right. The slopes were beautiful and empty despite the high-season crowds on the surrounding slopes (though not even those slopes felt particularly crowded). Ski passes for all the Cortina lifts/mountains are sold at an office near the bus station just north of the town center (near the Faloria gondola) and in high season cost about 45 euros a day, decreasing in daily cost as you increase the number of days on your ski pass. Leone & Anna came highly recommended by a friend of a friend. And on TripAdvisor, it was rated the best restaurant out of 24 in Cortina. Because the place is Sardinian, I thought the food would be a nice change from the heavier Northern Italian fare we’d been eating the previous nights, so I booked it. Our group of seven took a taxi there (it’s about an 8-euro ride from the center of Cortina), and when we sat down, there were plates of antipasti already laid out on the table. Initially, I thought it was just a generous offering covered by coperto, but not only were the antipasti not free, but also servers kept appearing with more, and we didn’t know how to say “no.” Most of the antipasti tasted fine, but the total bill for antipasti alone came to 70 euros, which annoyed me. I would’ve preferred ordering what we liked from the menu, rather than having the burden of having to turn un-asked-for food away. It all seemed a bit tricky by the resto. 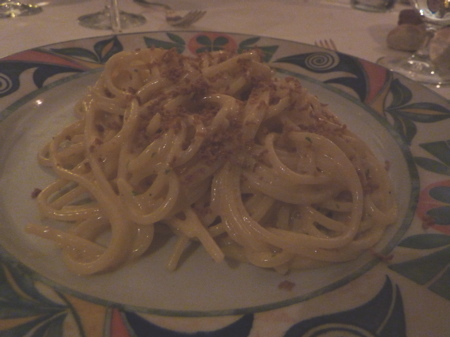 Although I enjoyed my spaghetti alla bottarga, prices were well in the 20+ euros range for main courses. Overall, not happy with the experience, especially for 69 euros a person for antipasti, a main course, and three cheap bottles of wine. In terms of apres-ski, when the lifts shut down at 4:30 pm, skiers would stick around at nearby rifugios for a beer, but even those rifugios shut down soon afterwards (and the ski bus back into Cortina center became very infrequent). Back in Cortina center, we dropped by a few bars (some of which came highly recommended) , but most of the spaces were small and therefore quickly grew packed. Cristallino Disco Bar: While this place had a lot of attitude on Saturday night (in a bad way), in reality it was just a waiting area for those who wanted to head over to VIP Club once it opened at 11:30. On other evenings, though, if you ignored the ever-turning, slightly-depressing disco ball, the place had a nice, relaxed apres-ski feel. A surprise winner for a weeknight drink. Enoteca Brio Duino: A small enoteca, so get there early to snag a booth. The charcuterie and cheeses made for great snacking, as did the range of local wines on offer. About ten minutes after we sat down at a booth, the place became extremely crowded with a mix of people dressed in sporty ski togs and elegant outfits (the older Italian ladies dressed in their furs were so retro I couldn’t help smiling). The bar at Hotel de la Poste: We dropped by on Saturday evening and discovered it was (1) pretty dead and (2) populated exclusively by the 50-and-over crowd. Nothing wrong with that, of course, but just not our age demographic. LP 26: Bigger than most places in Cortina and recognizable by the hams hanging in the windows. Not especially chic or lively despite the tables being full, but at least they serve beer and there are customers in theirs 20s and 30s there. VIP Club at Hotel Europa: this was supposed to be *the* place to be on Saturday night, opening at 11:30 pm. So we showed up at around midnight and discovered the act of the evening was country music-sounding. Not what we were expecting. Cortina was a great destination for skiing, and based on our lunches, it was a superior place for eating. Dinners in town weren’t half as impressive as the food offered on the slopes, and apres-ski was pretty quiet, but even so, I’d go back in a hearbeat. 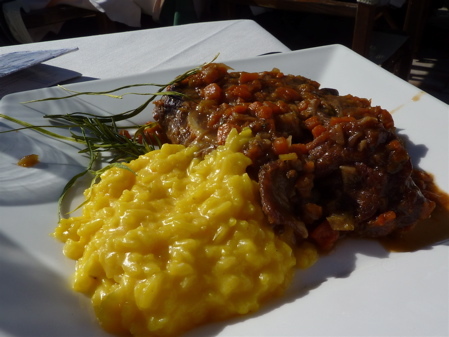 If you enjoyed reading this post, you might also enjoy reading about Baita Pie’ Tofana, a rifugio serving top-notch food in Cortina. Jon and I spent last week skiing in Cortina d’Ampezzo and despite some residual soreness (seriously, I must have thighs of steel now), I loved every minute of our trip. I grew up skiing almost once a week in the ultra-icy Poconos, which means that while I know how to ski, I have long associated the sport with anything except glamor and fun. 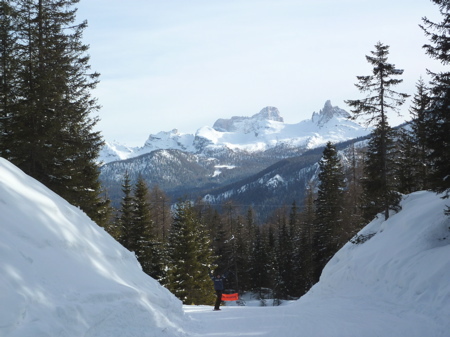 But when our friend, Jane, proposed a group ski trip and responded enthusiastically to the idea of going to Cortina, I jumped at the chance to experience a little dolce vita on the slopes. Cortina, several friends had told me, was a great place to ski if you value eating as much as (or more than) skiing. And just 24 hours after we’d booked our flights to Venice, this article (“Fresh Powder Meets Fine Dining in Cortina d’Ampezzo”) appeared in the New York Times travel section. Thus validating the feeling that we were on to a good thing. 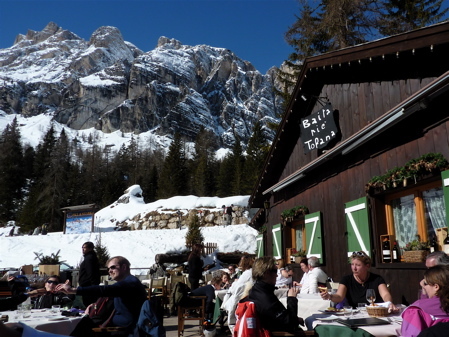 As the article describes, in Cortina, there are lots of rifugios (huts) where you can eat on the slopes. A few Cortina rifugios serve what you’d expect at a ski resort – sausages, schnitzel, french fries – all self-service on trays. But others, like the ones written up in that New York Times article, serve high-quality, delicious northern Italian food, sometimes on white tablecloths. The rifugio that caught our fancy so much that we ate lunch there three times was, surprisingly, not mentioned in the New York Times article: Baita Pie’ Tofana. A friend of a friend owns a house in Cortina, and he recommended Baita Pie’ Tofana as not just the best rifugio in the mountains, but also the best restaurant in Cortina. So despite having to ski down a few steeper-than-we’d-like bits to reach Baita Pie’ Tofana, Jon and I showed up for lunch on Day 1 of our ski trip, and three lunches later, Baita Pie’ Tofana holds a special place in our hearts. 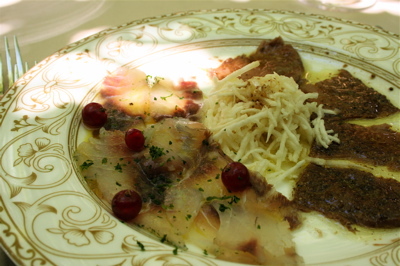 Our favorite starter was a warm salad comprised of radicchio and speck, both popular local ingredients. Setting aside the axiom that all things cooked with bacon are winners, this salad was a masterpiece of textures and flavors. 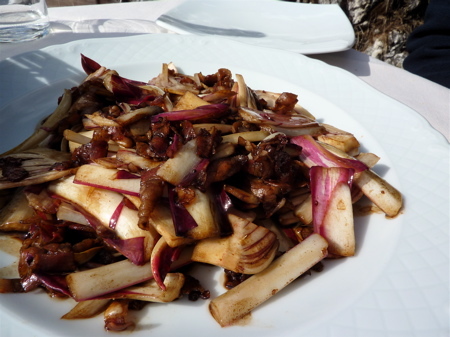 The mildly-bitter, crunchy radicchio complemented and balanced out the crispy speck and tangy-sweet vinegar. Of course, eating it outside on a sunny deck with views of the mountains and to a soundtrack of happy Italian diners helps. Perfetto. Given the kitchen’s masterful way with speck, it’s no surprise that I also loved Pie’ Tofana’s homemade, pillowy-soft gnocchi with speck and aubergine. I’m not a lover of beetroot and left to my own devices wouldn’t order it when there is speck on offer, but casunziei all’ampezzana is the local specialty, so Jon and I gave it a try. The beetroot filling was, as expected, sugary, but the dish was saved from cloying sweetness by salty Parmesan and nutty poppy seeds. 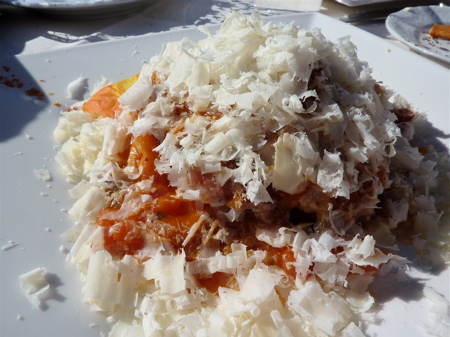 Everyone loves a mountain of snowy Parmesan curls on their rustic bigoli served in a spicy tomato sauce, no? 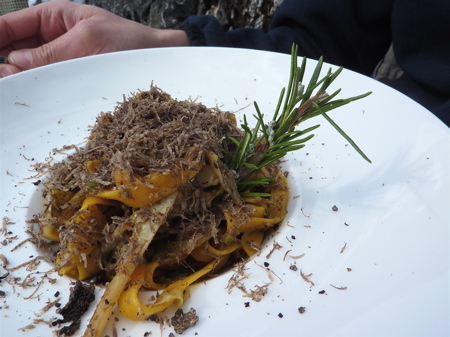 And on our last day in Cortina, we pushed the boat out and ordered the tagliatelle with veal sweetbreads and black truffle. The kitchen was generous with the black truffle, and the woody-mushroom shavings mixed well with the creamy sweetbreads. Definitely not your everyday ski fare. Ossobuco needs no introduction, but Baita Pie’ Tofana’s version included the biggest portion of marrow-in-the-bone that it has ever been my pleasure to scoop out and savor. And because I was skiing in between meals, there was no guilt. Score. 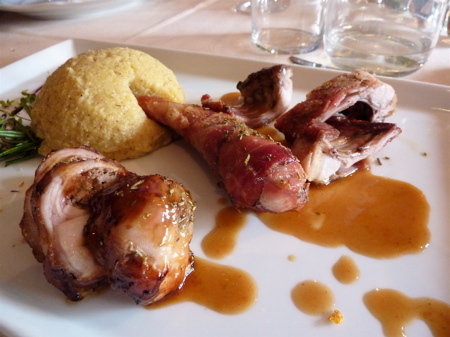 Despite its somewhat bizarre presentation (i.e., the rabbit bacon cone shoved into the polenta mound), Il Coniglio (rabbit served three ways) was another standout. There were roasted rabbit ribs and a juicy, meaty portion of rabbit loin stuffed with rabbit liver. 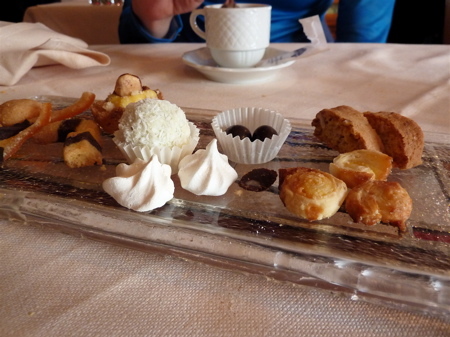 And there can’t be many places on the slopes that end your meal with mignardises. Jon and I loved eating at Pie’ Tofana. It wasn’t just the food that won us over, but also the unique experience of sitting down for a fine meal dressed in grubby, sweaty ski clothes while taking in the mountain scenery and sunshine. Servers were always polite and professional, and by Lunch Number 2, they gave us a lot less attitude for not having made a reservation in advance. The only downside to Pie’ Tofana was the price tag. For the quality, the food was reasonably-priced, but I’ll admit I was annoyed by the 5-euro-per-person coperto (a bit high, I thought) and 4.50 per bottle of water (because God forbid you can successfully order tap water in Italy). Jon and I generally each had a pasta and shared a main and starter. With a shared glass of wine, our lunch tabs averaged 65-70 euros for two. So if you’re an easy-going skier but a champion eater, get thee to Cortina, and be sure to stop by Baita Pie’ Tofana. Vecio Fritolin was a tip we got from Mark Bittman’s article on Venice last year. The draw for us was his description that it’d serve the best fritto misto in Venice. Fried? Seafood? I’m there. It took us ages to find the place. Not because it was any harder to find than other restos in Venice, but because we didn’t check a map before setting out. We’re cool with asking people for directions, but for some reason we had to pinball around for about thirty minutes before we hit the place. Luckily, Vecio Fritolin was pretty empty for Sunday lunch. Last weekend, Jon and I returned to Venice. We were last there five years ago, and despite Venice’s popularity with tourists (and the expensive-but-mediocre restaurants that abound where tourists go), we’ve been itching to go back for a while. There was a lot of overlap in recommendations from our trusted sources, so Jon and I could only conclude that tasty restaurants are not quite a dime a dozen in Venice. [Contrast with, say, Paris, where there are so many good restaurants that no list of favorites is ever the same.] Also interesting is that these books Jon and I used five years ago had been recommending the same restos we ended up visiting last week on our friend’s and Mark Bittman’s recs. I guess considering Venice isn’t marketing “cutting edge newness” as its selling point, it’s no surprise highly-recommended restos from five years ago are still highly recommended today. So, our first stop: Corte Sconta. Uniform rave reviews by those books we used five years ago, SlowTrav, multiple blogs, and by our Venetian friend. And now by me. Let’s start with Corte Sconta’s beautiful outdoor dining area in the back (see photo at top). Grape vines shade you and your table is sun dappled. It’s magic. Our server gave us menus, but our friend had made us promise to get the “mixed seafood appetizers” for 26 euros a person. You put yourself in the hands of the chef and eat whatever was fresh that day at the seafood market. It’s omakase, Venice style, and it totally paid off. You get so many plates of seafood that Jon and I probably didn’t need order additional pasta courses for 16 euros each.